Guest Luccia Gray: Clothes in Jane Eyre’s Time. Fellow writer and sister blogger, Noelle Granger, was kind enough to ask me to write a guest post for her blog. She suggested something related to fashion and history, so it’s a great pleasure to offer this overview of the clothes in Jane Eyre’s time, which includes a general reflection on Victorian and Regency fashion, and how fashion mirrors the moral code of the time. In the later part of his life, George III suffered from recurrent and eventually incapacitating dementia and blindness. From 1811 to his death in 1820, he lived in seclusion at Windsor Castle. 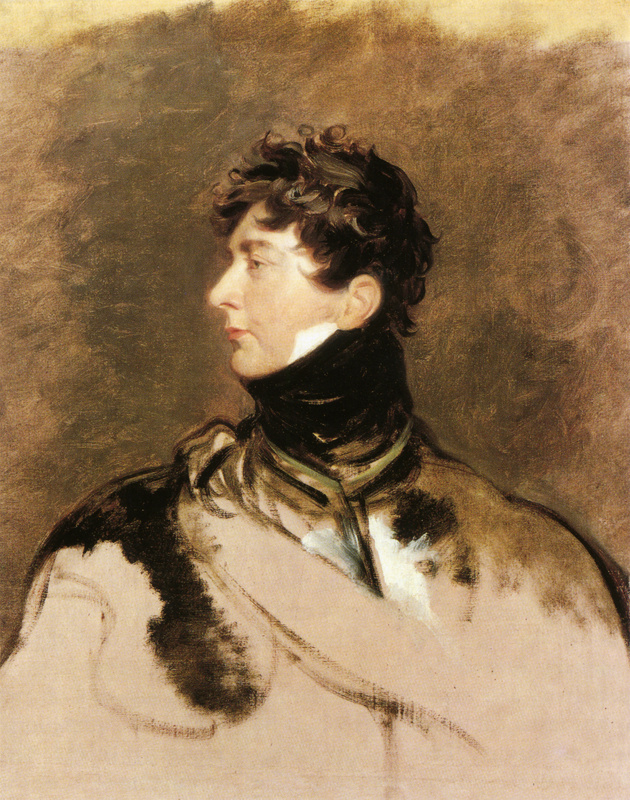 As a result, his eldest son, George, Prince of Wales, became Prince Regent, until he succeeded his father as George IV. Much to his father’s irritation, the Prince Regent was an extravagant squanderer, gambler, and womanizer. His escapades included heavy drinking, drug consumption, and numerous mistresses. He also had very expensive tastes in clothes and decorating his palace, and was a generous patron of the arts, so he was frequently in debt. On the other hand, he was reportedly a witty conversationalist, and enjoyed partying. The Prince Regent’s indulgent lifestyle was reflected in the social life, fashions, and comparatively lax morals of the Regency period, which sometimes refers to a more extended time frame than the decade of the formal Regency, spanning from 1811 to Queen Victoria’s coronation in 1837. It was during the early years that Jane Austen, who died in 1817, wrote her novels. Charlotte Bronte was born, a year earlier, in 1816, and although Jane Eyre was published in the height of the Victorian era (1847), there is plenty of evidence to support that it is set before this period, during the Regency Era. In the early 1800s, women’s clothes became more practical, for example, women began wearing shorter and lighter dresses without restricting long trains or hoops, which were more suited to carrying out daily routines. They also became much lighter. Women wore thin, gauzy outer dresses, which could be changed and washed more frequently. It was also during this time that fashion magazines such as ‘La Belle Assemblee’, one of the major ladies’ fashion magazines of Regency Era, began its publication. The ladies of the time often only wore three garments; a chemise, a corset and a gown. This was a striking contrast to the clothing of both the preceding and succeeding periods with their multiple layers, crinoline, and heavy fabrics. 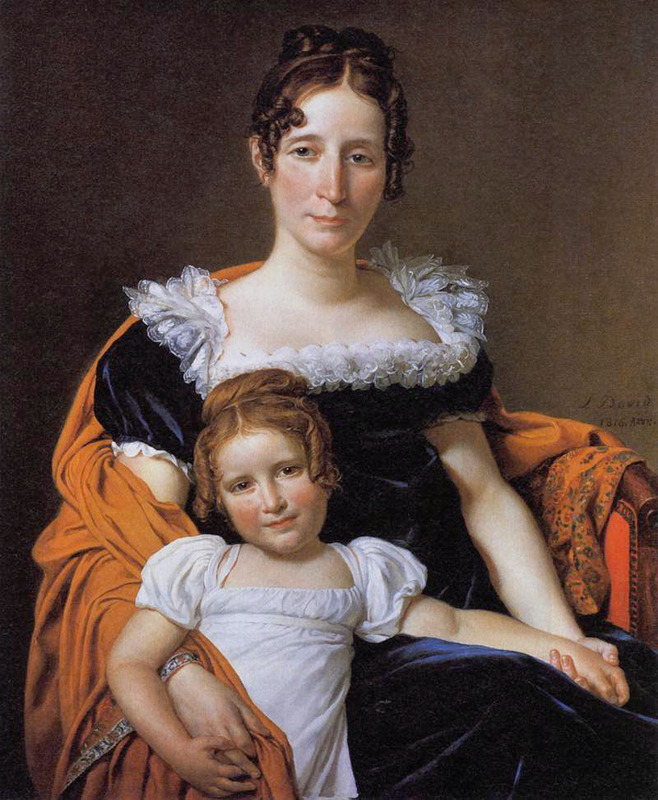 The first two paintings of Regency fashion reveal bare arms, chest, and necks, in both adults and children. 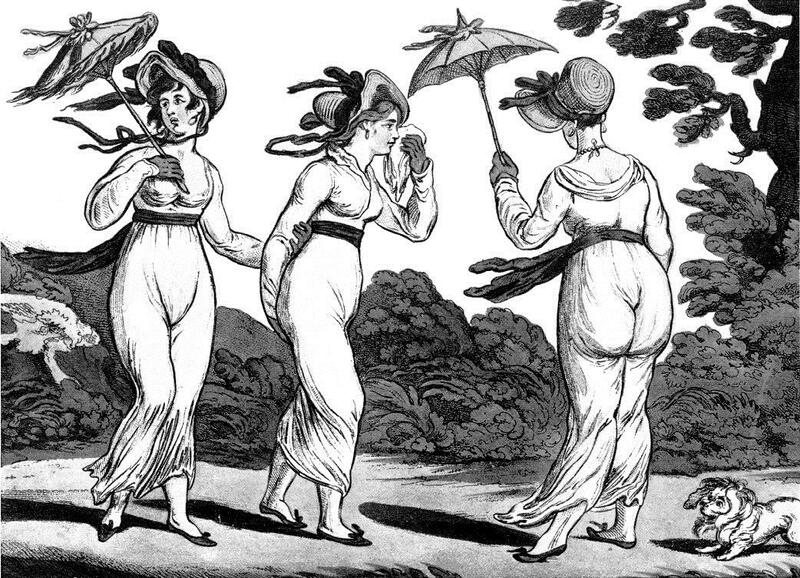 The satirical engraving “The Graces in a High Wind”, by James Gillray (published 1810), shows us just how loose and flimsy ladies clothes were at the time, easily allowing the observer to identify the ladies’ contour beneath the dress! A satirical cartoon from Harper’s Weekly (New York) 1857. Some Victorians may have joked, but most Victorians would have felt uncomfortable to be reminded that their mothers or grandmothers had once danced and visited wearing what has come to be called Empire or Regency fashions, which would no doubt have been considered indecent according to Victorian convention. 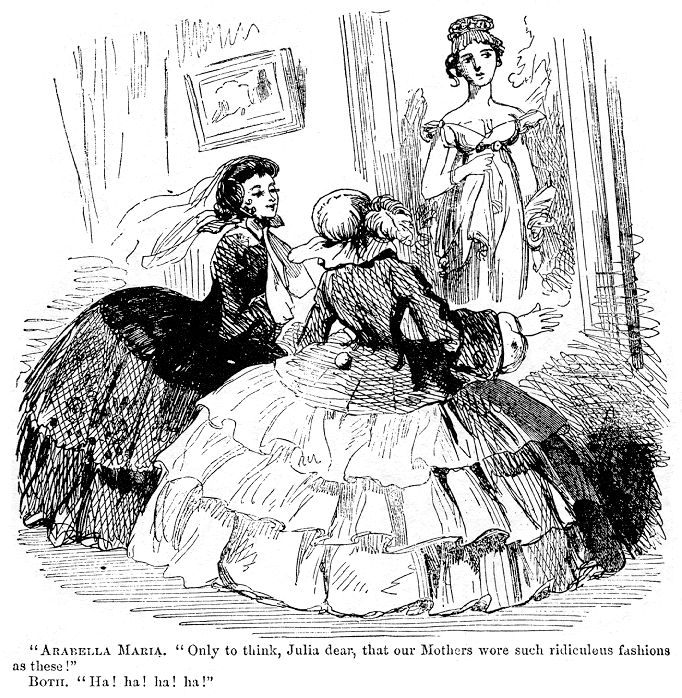 Women’s skirts literally swelled and became more cumbersome in the Victorian period. At first the skirts were supported by several petticoats, one of which was of a stiffened silk or of a silk and horsehair fabric, known as crinoline. Many of the bodices and blouses had high necks stiffened with bones or wire. Crinoline cutaway diagram from Punch magazine, August 1856. Breasts, chests, and arms were covered, the high-waisted Regency styles were replaced by lower, tight bodices focusing on the waist, and the stiff crinoline petticoats made it impossible to guess the ladies’ shapes below the layers of heavy clothing! The clothes in Jane Eyre are definitely Regency style, and not Victorian, which leads us to assume that the action takes place in the 1830s, at the latest, probably around the time Charlotte herself was 20 years old, in 1837. 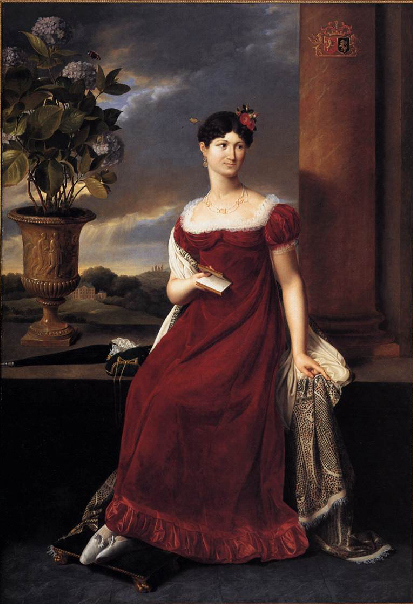 There are few detailed descriptions of clothes in the novel, but Mrs. Fairfax describes Blanche Ingram as, ‘Tall, fine bust, sloping shoulders; long, graceful neck.’ Indicating her bust and shoulders were clearly visible in a low-cut, Regency dress. Also there is no mention of crinoline. Clothes marked class difference very clearly, the fabric and colours of lower class characters such as teachers and children at Lowood, and servants, were clearly different from the clothes worn by the upper class characters. They wore darker colours such as purples and browns, and were made of stuff, a type of coarse thickly woven cloth, or wool. We are told that the girls at Lowood all wear, ‘brown stuff frocks of quaint fashion, and long Holland pinafores’, while Miss Temple, her teacher and mentor at Lowood, wore, a purple cloth dress with black velvet trimming. Months later, when Mr. Rochester’s wealthy friends were invited to Thornfield, Jane’s drab, dull, and plain clothes, contrasted strikingly with his richly dressed guests, and their crimson velvet robes, shawl turbans of gold-wrought Indian fabric, white muslin dresses and coloured sashes, pink and white satin robes, silk stockings and white satin sandals. Some years after marrying Rochester, at the end of the novel, we finally see Jane dressed in a colour other than black, brown, or grey. Rochester, recovering his eyesight says, ‘And have you a pale blue dress on?’ and she answers affirmatively. Jane Eyre has become Mrs. Rochester. She is married to the man she loves, has had a son, has improved her station, and is wearing brighter colours, at last. Although Charlotte Bronte was writing about the Regency period, she was doing so from a more solemn and moralizing, Victorian perspective, which is why Jane dislikes the comparatively flimsy clothes, bright colours, frivolity, and extravagance of the Regency period, represented by Blanche Ingram, Miss. Brocklehurst, and her cousin Georgina Reed. 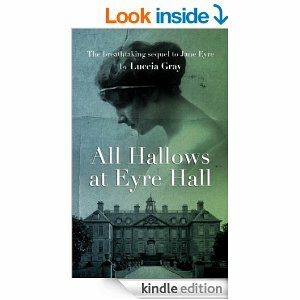 Luccia Gray is the author of All Hallows at Eyre Hall, which I’ve reviewed and given multiple thumbs up. Her blog is Rereading Jane Eyre (http://lucciagray.com), and I encourage everyone to go there for a visit. You won’t be disappointed! Thank you so much, Luccia! Fascinating how clothes change and how fashion dictates what we all wear. I remember that scene when Jane runs up to her room to change into her “other” dress. How often did they launder their clothes. Were aprons and protective overgarments used more. I can’t imagine how the clothes didn’t get filthy and worn very quickly. I also think it’s interesting how color was much more individual in the past. Before industrial clothing production and the fashion industry selecting the palette for us, I would think the colors a woman wore would have been a reflection of her personality and carefully thought through. They don’t look very comfortable though ~ and the Regency style was very revealing for any buxom woman. Thank you for your invitation to guest post on your blog, Noelle. The stark contrast in Regency and Victorian moral conventions, externalised by their distinctive fashions is a fascinating topic. Crinoline sounds like torture! I totally agree – aren’t we lucky! Thanks for a wonderful post! This is an intriguing and fascinating article answering questions inviting more. Glad you enjoyed it! 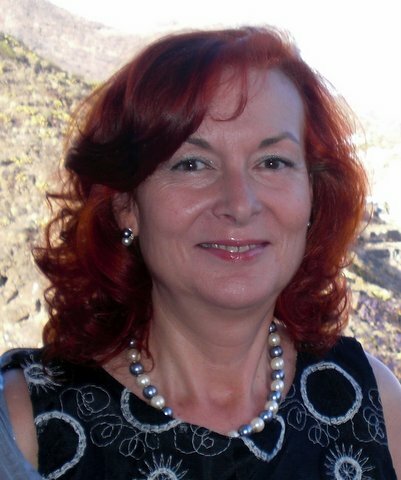 Check out Luccia’s blog – she picks wonderful topics. I devoured this post! Jane Eyre is one of my all time favorite novels, and as I read the snippets of her conversation with Mr. Rochester over his questionable fashion purchases for his plain little governess, as well as Jane’s thoughts about her own wardrobe, so much of the novel came back to me. I have your book – and look forward to reading it. Thanks for such an interesting essay about the clothing of the Regency period. Aren’t you glad we don’t have to wear those clothes? Hello Luccia. Lovely post. Thank you for writing on Noelle’s blog — a most wonderful place to be. I love the red dress. So much beauty and detail showcased here as well as modesty (even if behind closed doors theirs were all but modest lives) and that makes reading about this time period all the more interesting. I love looking at Jane Eyre through her clothing! I don’t think I paid too much attention to the fashion mentions when I read it the first time but this makes me want to revisit it. 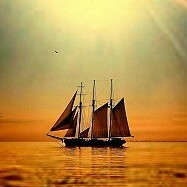 Fascinating post! Wonderful walk back in time Luccia and Noelle. Loved the look at the fashions and where they sat on Jane Austen’s characters. And yes, I’m glad I don’t have to wear them although Regency isn’t a lot different from what we are wearing here this summer.